Back down to earth with a bump today, well beaten by a better team on the day. Vale were hit with a problem during warm up when Hunter hurt his back and had to be replaced by Currie. Vale started the game brightly and were giving as good as they were taking. However, gradually Kelty were taking control and Vale were finding it very hard to keep possession. Kelty were closing down very fast and their strength and air advantage was becoming apparent. Kelty’s first goal arrived in the 25 min when a corner on the right was headed home by Carstairs. Vale only chance of the game arrived when after a good move a Stewart shot narrowly missed in 28 mins. Any chance of a comeback in the second half was finished in the 50 min when Smith bundled over the attacking player in the box and a Husband knocked home the penalty. Kelty missed a few good chances before finally completing the scoring in the 75 min when Gay tap in a cross to make it 4-0. 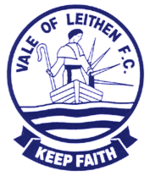 Overall a poor performance from the Vale, but take nothing away from Kelty who were an excellent side. Luxury Lawn Man of the Match was Craig McBride.